The boy and the penguin are back! In this adventure, the penguin really wants to fly. Ignoring the boy’s advice that it is impossible, he leaves his friend to go searching for a chance to get his feet off the ground. But will flying be everything he had hoped? This is the sequel to the internationally best-selling picture book Lost and Found and is written by the multi-award-winning (and rather good-looking…) author/illustrator Oliver Jeffers. ‘Up and Down’ is a funny yet touching story about the importance of friendship and reaching for one’s dreams, that speaks to all ages. In this production, live theatre was integrated with magical projections on the big screen based on illustrations from the book. It was a multi-sensory show with original music, creative lighting and innovative props to keep all members of the family absorbed (babies and dads included!). Our audience were humming along to the catchy tunes, giggling together at the funny story, and sneaking a cuddle during the exciting bits! Oliver Jeffers was born in Port Hedland, Western Australia in 1977, but spent his childhood in Belfast, Northern Ireland. A multi-talented artist, his work includes figurative painting, installation, illustration and picture-book making. His work has been exhibited in New York, Dublin, London, Sydney, Washington DC, Belfast and elsewhere. Up & Down, published by HarperCollins UK, is the fourth story about the boy and is the sequel to the award-winning, best-selling Lost and Found – now a BAFTA award-winning animated film. How to Catch a Star and The Way Back Home complete the quartet. His picture books have won numerous awards including the Nestle Children’s Book Prize Gold Award, Blue Peter Book of the Year and he has been shortlisted for the Kate Greenaway Medal four times. The Heart & the Bottle has been made into a highly acclaimed iPad application. He now lives and makes art in Brooklyn, New York. 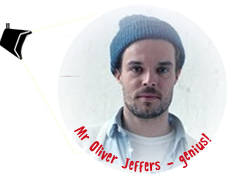 You can find out more at www.OliverJeffers.com. Here are a few production shots of Ga Ga Theatre’s first production, ‘Up and Down’, which is toured around cinema venues in London in Autumn 2013 and Spring 2014. Jake Addley – The Boy! Emily Altneu – The Penguin! Here are a selection of reviews from the press and general audience members.